As a source of inspiration, I can highly recommend that your bonsai education include some exposure to some of the older Japanese styles, styles that you find in the old Japanese Bonsai books that actually show up from time to time in estate sales of ex-hobbiests and used book stores. Yes, they are in Japanese, but we are talking about the pictures! These predate the Omiya/Kyuzo Murata school that influences modern Japanese bonsai. They are a little wilder and altogether more natural than the current Japanese idiom, which is getting a little far-removed from the natural world, I think. Another influence on them is that they predate the use of wire, which only came about after the last World War. The techniques do strongly influence the results, and the results influence the trends. 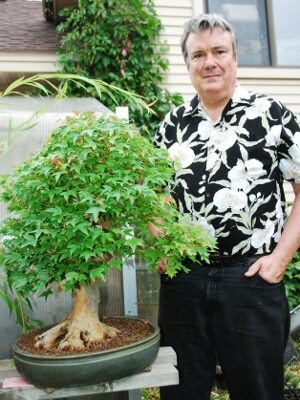 An excellent source are old copies of an out-of-print Japanese bonsai magazine, “Shizen to Bonsai”. This means “Nature and Bonsai”, and the title tells it all. It is well worth your efforts to obtain and your attention. To understand where you are going, you must know where you have been. The key word here is “understand”, and art is a record of things seen and understood.